There is something truly special about Vermont and the food movement circulating throughout the state. Farm-to-table is one thing, but its elevation is palpable up here. Fresh produce is taken seriously, ingredients used in true and innovative ways. 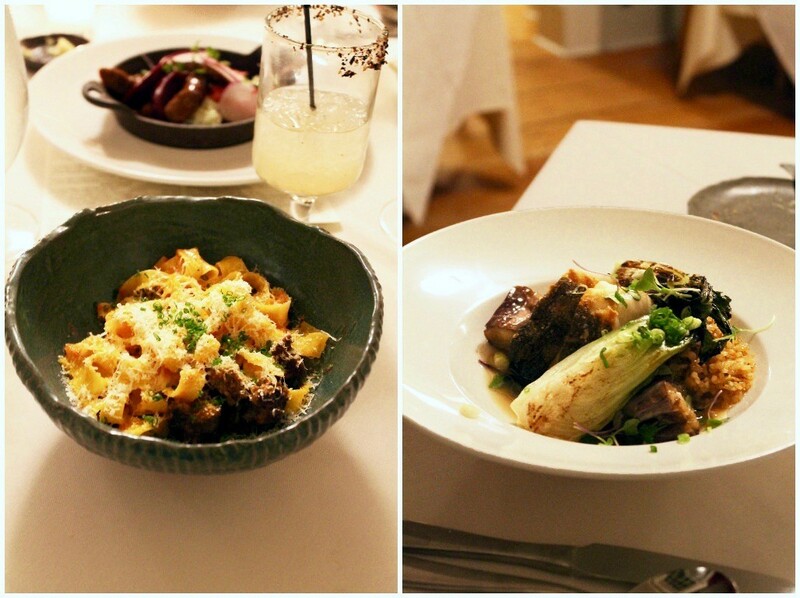 Mainly, Vermont respects its food, and SoLo Farm & Table takes this notion to a superior level. Nestled about an hour south of Woodstock, on the outskirts of the Green Mountains, Chloe and Wesley Genovart have created a gastronomic destination in South Londonderry, Vermont. Wesley’s Spanish culinary roots and acclaimed kitchen experience, along with Chloe’s time as maitre d’ at Thomas Keller’s Per Se restaurant, culminated in their mutual dream of opening SoLo Farm & Table in July of 2011. Wesley’s professional repertoire includes New York’s Degustation and Daniel, but SoLo has presented him an opportunity to take the helm of his own countryside kitchen – a place in which he can mix modern techniques with a prominent Mediterranean influence. 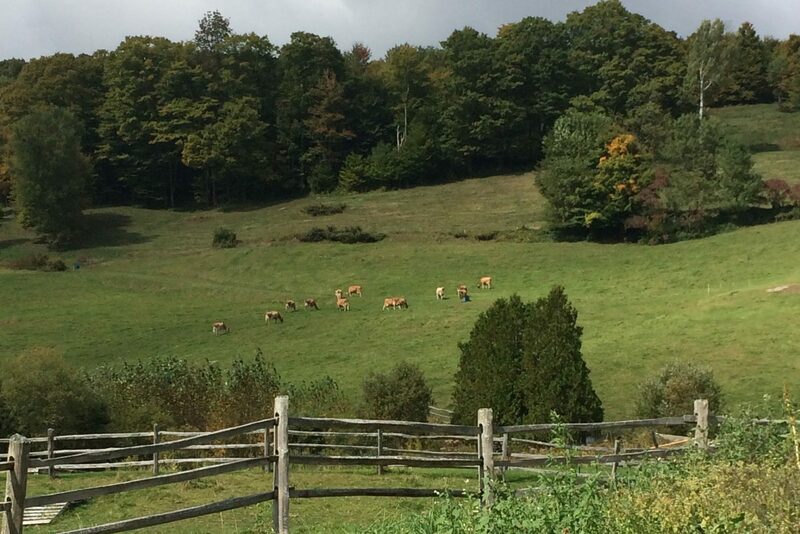 Vermont has provided this chef a chance to forage and source from local producers to better his sustainable practices. Chloe, on the other hand, grew up in Vermont and spent extensive time traveling with Wesley, soaking in different cultures and food throughout the world. 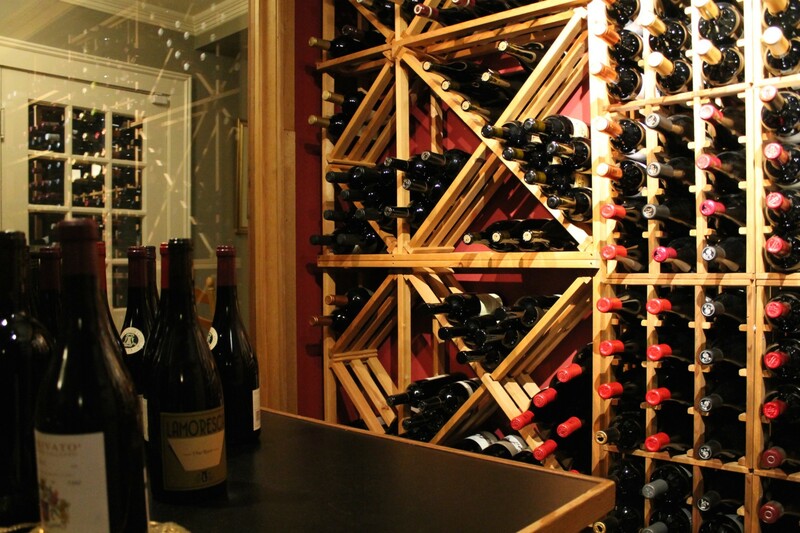 Chloe helped Wesley open New York East Village’s Degustation in building their wine program and running the dining room. With littles Rafael and Esme in tow, Chloe and Wesley have now created a truly family run establishment aimed to grow and give back to the community here in Vermont. SoLo’s menu changes with the ongoing seasons, evidenced by their highlighted ingredients from either the restaurant’s garden, or sourced from local farmers and growers. Whole animals are purchased to butcher in-house and utilize all parts in varied ways, fresh fish is sourced from small and select purveyors, and all pasta is handmade and rolled in-restaurant. In true Vermont fashion, SoLo reveres quality and sustainability while maintaining very meaningful relationships with its local farmers, cheese makers, brewers, and bakers. If this isn’t impressive enough, Chloe and Wesley have cultivated the restaurant’s own garden with raised beds to nurture produce such as peas, tomatoes, and herbs from seed. Chloe and Wesley undoubtedly respect each ingredient entering their kitchen, and that passion is so reflected on the plates served every night to their guests. One night in particular, we make the worth-while trip to South Londonderry for a much anticipated dinner. 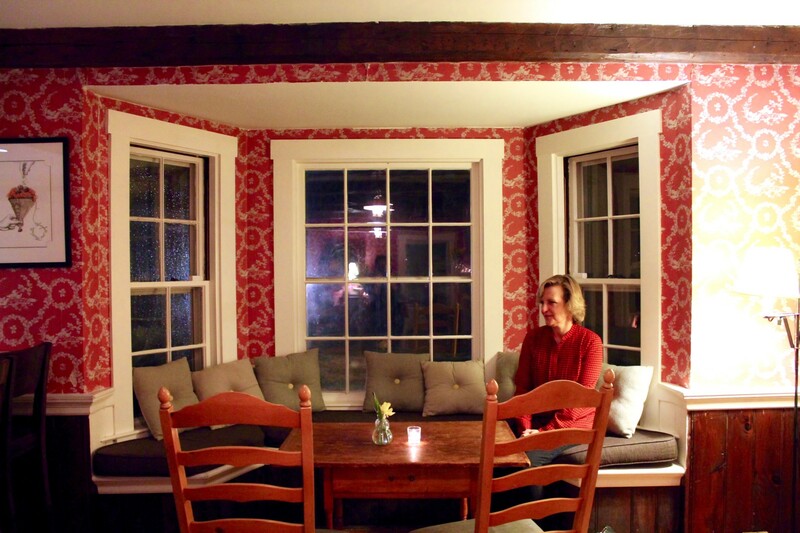 We enter the restaurant, a charming home built circa 1790, to the sound and warmth of a crackling fire. Chloe greets us with a welcome smile before luring us with a pre-dinner cocktail. 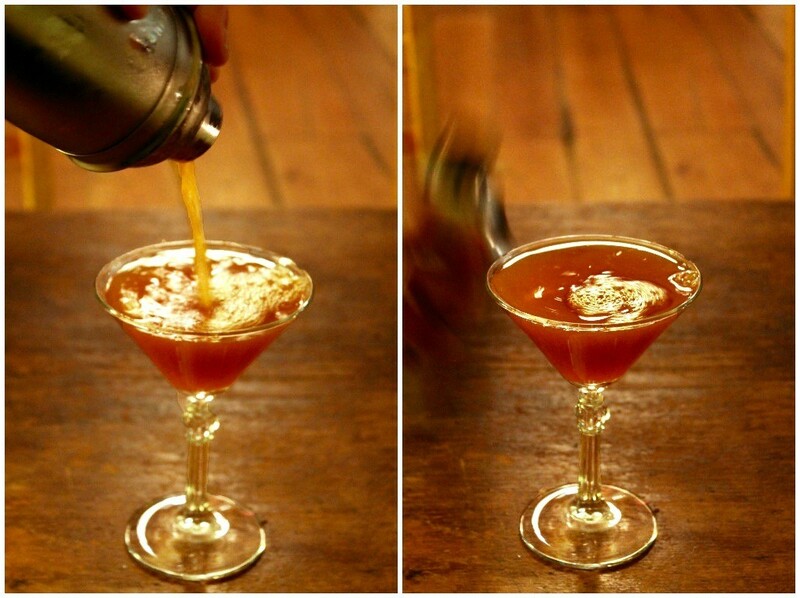 Most keen on the seasonal drinks, we quickly dub the Tea & Honey as the highlight of our cocktail hour. Made with specially sourced bergamot oranges Chloe found from California, this citrusy fragrant drink had us talking for weeks after our initial taste. 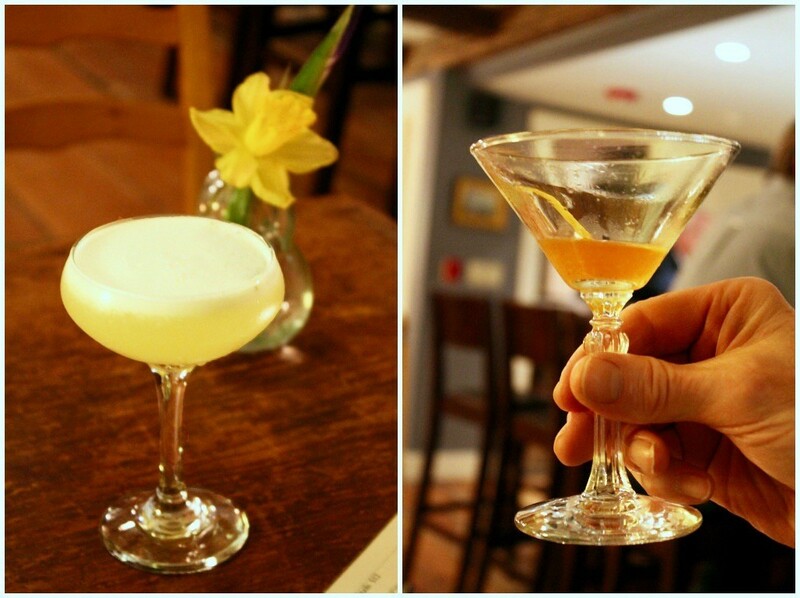 To this day, we continue to experiment with the delightful tastes we remember so fondly from the SoLo bar. 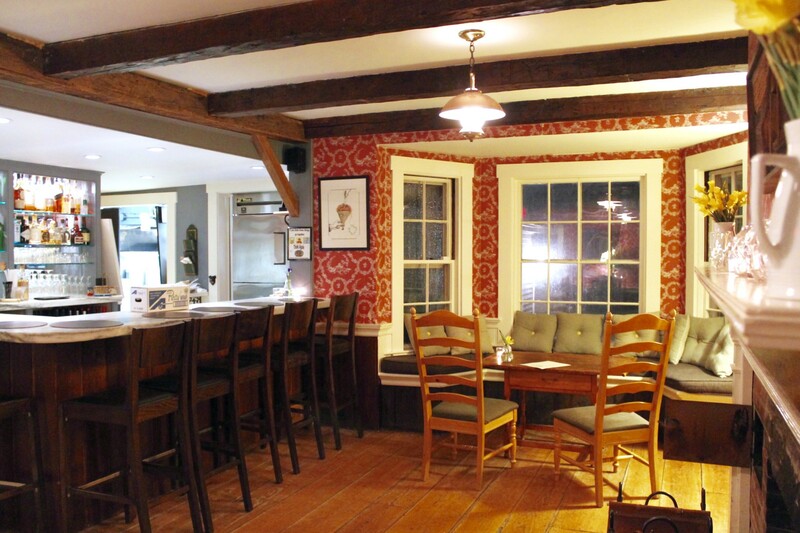 SoLo embodies a classic and cozy Vermont ambiance, seamlessly combined with contemporary details. We swoon over the restaurant’s chic patterned wallpaper, white marble bar, and clean linen tablecloths – all blended to tactfully satisfy the likings of both the metropolitan foodie and down-home cook. 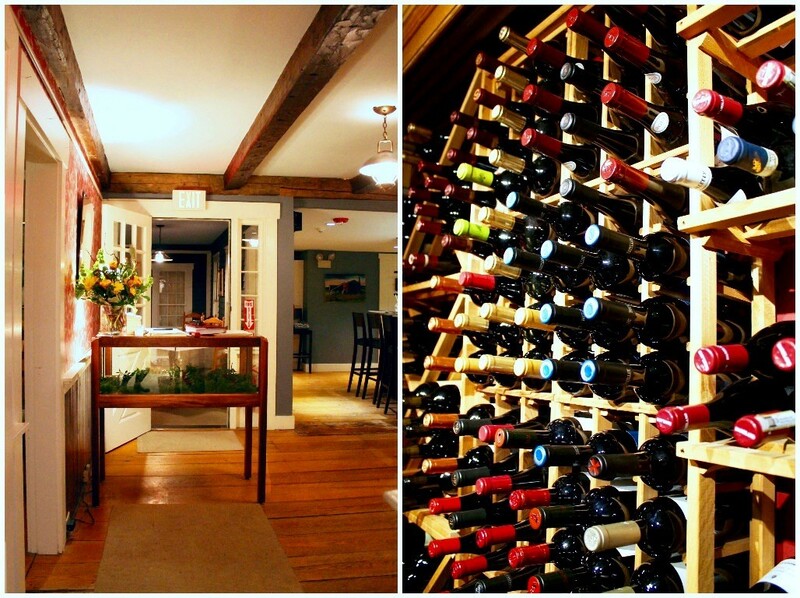 Just as an original Vermont home would be structured, different rooms fashion settings all of their own. One room patiently awaits a large party to occupy its extensive tabletop; another stonewalled sunroom adorns two sweetheart tables and flickering tea lights. Lastly, the main dining room hosts a number of tables, strategically placed to surround the restaurant’s candle-clad fireplace and wine room. In the spirit of sharing, we each order different dishes to sample as many menu items as possible. 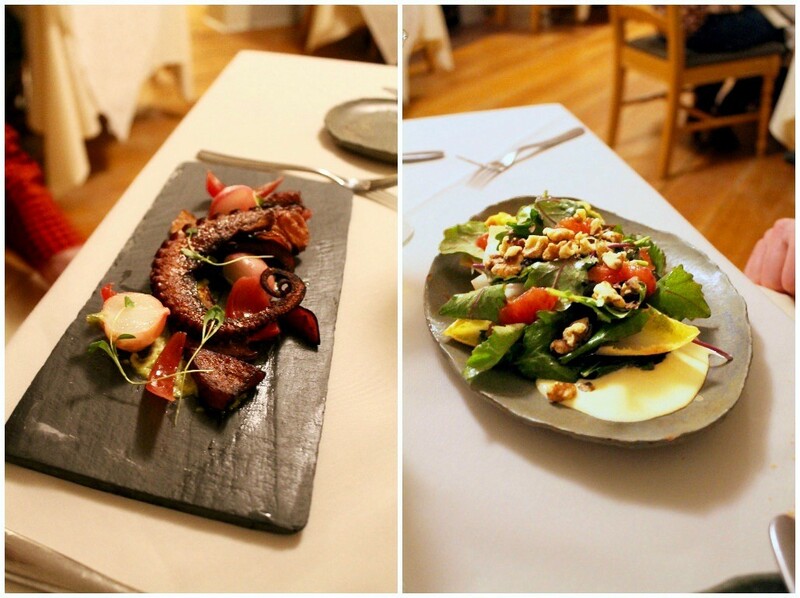 Our appetizers consist of Braised Crispy Spanish Octopus, Endive Salad, and Scallops with Smoked Crab. The tender meat of the octopus is coupled with a crispy outside layer, and paired with roasted squash, pickled red onion, spiced pepitas, and poblano ash. Rick mentions the first time he tasted this dish. It knocked his socks off. Wesley shared that he sous-vides the meat for 24 hours to keep it tender (not chewy) and crisps the tentacle on a wood-fire stove before serving. So impressed, Rick was inspired to purchase his very own sous-vide cooker with which to experiment at the inn. He now uses the sous-vide on a weekly basis for the inn’s breakfasts. The salad is an assemblage of fresh produce, flavorfully heightened by a decadent pool of “Cloud Nine” cheese from Woodcock Farm. After all, who wouldn’t want to pair their crisp, farm fresh produce with melted artisanal cheese? 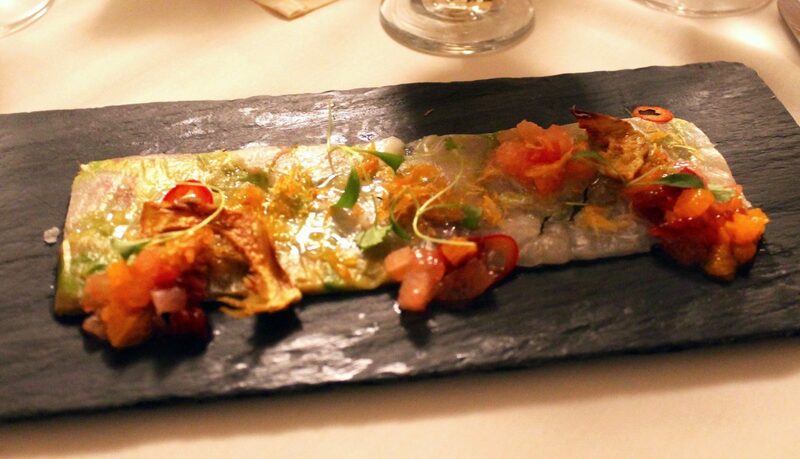 The scallops are also presented in a way we had never seen – flattened on a slate with large flakes of smoked crab and chopped blood orange to create a well-balanced plate of seafood and citrus. As a special addition, we sample the Grilled Sourdough Tartine, made with smoky tomato jam, cured sausage, micro kale, wild honey, and a sunny-side up hen egg. This, in particular, we consider one of the most delicious bites on the menu – the ultimate combination of savory sausage and sourdough, a hint of sweet and saltiness, topped with an irresistibly delicate egg. If you are to choose one appetizer, this is the item to order. We go on to choose Lamb Bolognese, Arroz Con Pollo, and Herb Roasted Atlantic Cod for our entrees. My bowl of hand cut tagliatelle is topped with house-made tomato sauce, crumbled lamb sausage, and grated parmesan cheese. While pasta portions are warned to be a bit smaller than the other entrees, this bowl was just enough to keep me satisfied and open to trying multiple courses. 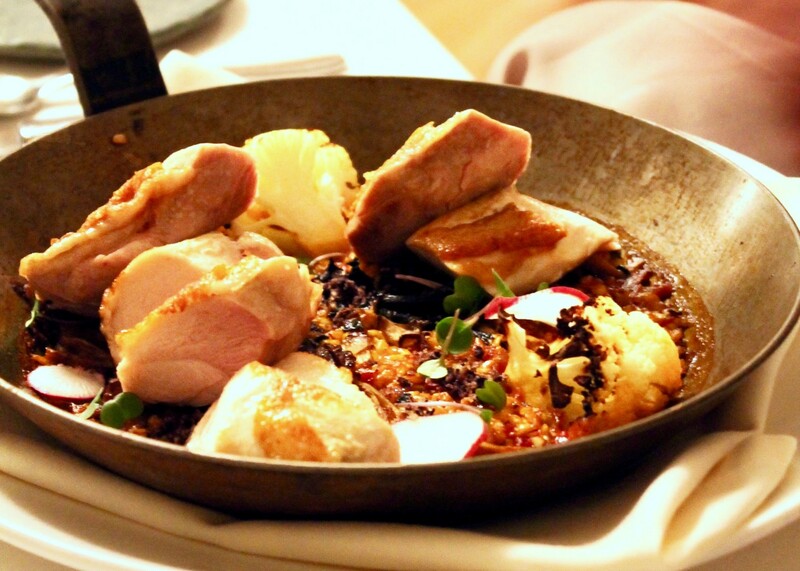 Paying homage to Wesley’s Spanish roots, our order of Ephraim Farm chicken comes in a cast iron pan of dirty rice, mushroom, and sliced radish with black olive breadcrumbs. Third, fried brown rice, grilled eggplant, and baby bok choy accompanies the roasted Atlantic cod in an aromatic fish fume. Even with the highly anticipated bread pudding on our mind, we can’t help but sample the cherry and chocolate pot de crème that also appears on our table. The cherry-chocolate combination satisfies the chocolate lover in all of us. However, Wesley’s Spanish take on bread pudding, a Spanish Torrija, wins us over. A slice of bread soaked in milk and spices, the torrija makes for the perfectly bready, not-too-sweet dessert. The bread is accompanied by a vibrant apple sorbet prepared in Wesley’s Pacojet, known to micro-puree deep-frozen foods and create intensely fresh flavors. The Pacojet is one of many modernist techniques Wesley incorporates in his kitchen. From thoughtfully sous-vide ingredients to the Spanish flavors drawn from Wesley’s background, SoLo has brilliantly mastered the refined farm to table dining experience. 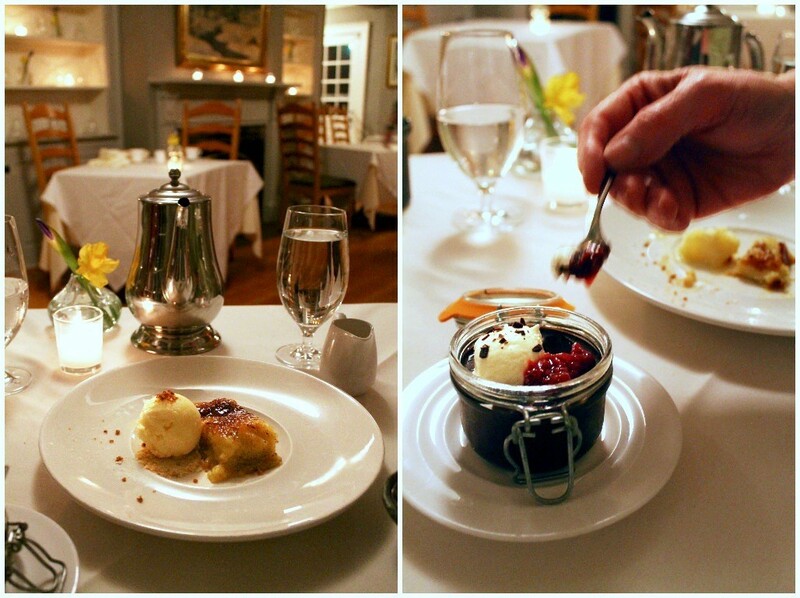 SoLo is undoubtedly one Vermont restaurant we frequent and recommend with great confidence. 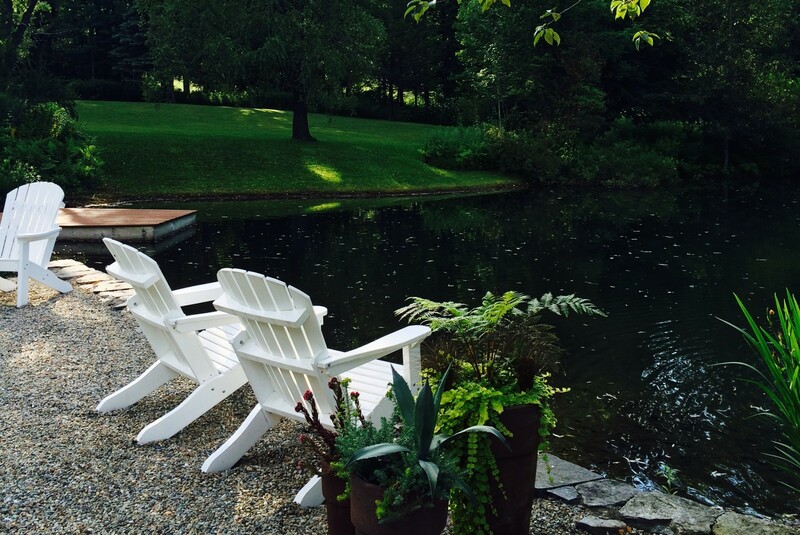 Whether you are a city dweller visiting the countryside or a Vermont native, the Genovarts have created a destination to please the highest of expectations. 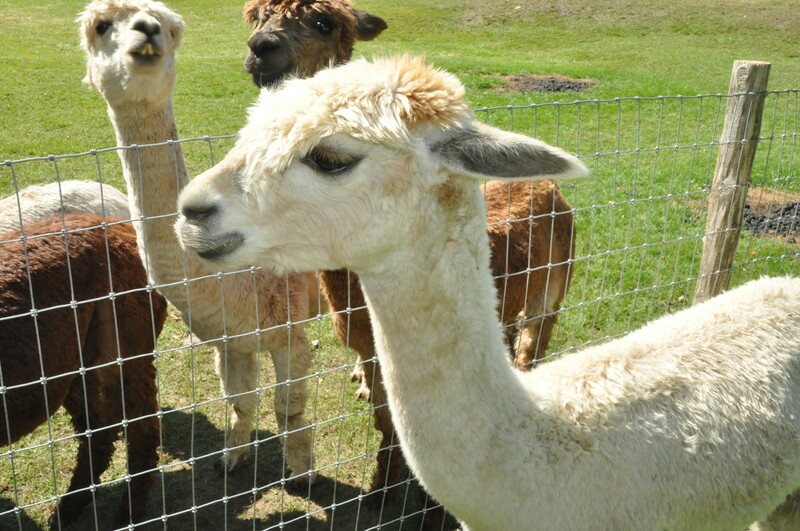 You do not want to miss this very worthwhile experience here in Vermont.